Chocolate, cake, strawberries, and champagne. All the best treats of Valentine's Day! Optional: lollipop sticks, styrofoam block (to hold pops upright), sprinkles, and silicone molds. 1. Combine cake mix and 12 oz champagne (no eggs, oils, or water) and mix well. Bake according to directions. 2. Cream butter with mixer and gradually add powdered sugar until mixed well. Stir in ⅛ cup champagne. 3. Crumble cooled cake into a large bowl. Add frosting and mix thoroughly with hands. 1. Roll cake and frosting mixture into 1″ sized balls. Chill for approximately 30 minutes in the refrigerator. 2. Melt CANDIQUIK® Coating in Melt & Make ™ Microwaveable Tray according to package directions. 3. Insert a lollipop stick into each cake ball. 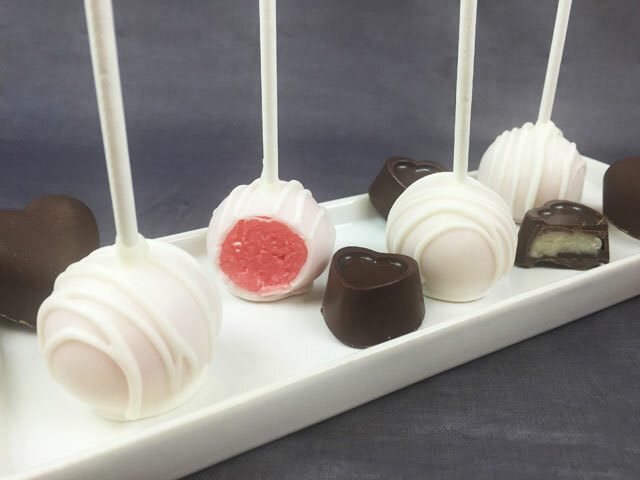 You can dip the lollipop stick in a small amount of coating before inserting into the cake ball if you have issues with it falling off the stick. 4. Dip cake pops or balls in melted CANDIQUIK® Coating; allow excess coating to drip off and place on wax paper or in the Styrofoam block. Decorate with sprinkles if desired and allow to set. 1. Spoon a small amount of melted coating into each mold cavity, rotating to coat the bottom and sides and allow to set. 2. Press cake mixture into chocolate-coated molds until about ¾ full. Top with additional coating. 3. Once completely set, pop cake-filled chocolates out of heart mold. Repeat until all cake and CANDIQUIK® Coating is gone.